Although Tannoy is now owned by a Danish ProAudio company, it has always operated successfully across all loudspeaker sectors, from the smallest AV satellites right through to exceedingly loud ship's foghorns. The Mercury name has long been given to its mainstream budget domestic hi-fi models, and this latest Mercury F-series, which includes four stereo pairs plus AV-oriented extras, can trace its ancestry back several years. 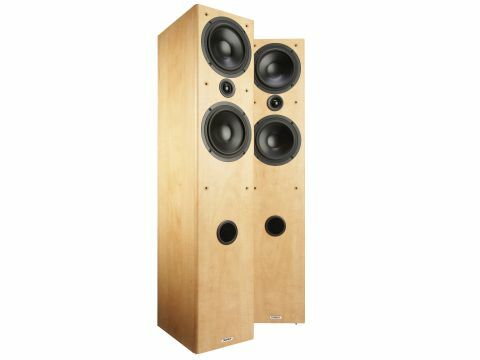 This £350 per pair Mercury F4 has much in common with a Fusion 4. Both share a similar two-way configuration that uses twin bass/mid drivers placed above and below a solitary tweeter - the so-called d'Appolito arrangement. Finished in a decent enough vinyl woodprint (apple or dark oak are the options here), the generous port-loaded enclosure provides an internal volume of 40 litres. Most is built from 15mm MDF, but the front panel is in heavier 19mm stock, with nicely rounded edges, and internal braces reinforce the whole carcase. Looking rather monolithic and regrettably lacking any form of plinth, fixing for the 6mm spikes proved satisfactory, and stability seems respectable enough. The main drivers have 170mm frames and 120mm diameter doped paper cones, giving a generous total diaphragm area that is further augmented by a front port. Interestingly, as delivered the port was filled by an open-cell foam bung, which doesn't block it completely but does resistively damp its output. The drivers are magnetically shielded, the tweeter has a 27mm soft dome and neodymium magnets, and twin terminals are fitted to allow bi-wiring. The grille mounting lugs are coloured to match the enclosure here, which is a nice touch, while the grille itself is an attractively neutral purplish-brown. At first sight one would tend to assume that a large speaker such as this, with two main drivers and port loading, would need to be kept well clear of walls. Surprisingly that proved not to be the case. In fact, the bass alignment is quite dry, even with the bungs removed, so the speakers work best when quite close to a wall. Whether one chooses to use the bungs or remove them is really a matter of taste - a question of whether one prefers bass that's a little 'dry' (with bungs), or slightly 'fruity' (without bungs). The double main drive arrangement has several obvious sonic consequences. The most positive of these is a degree of dynamic grip and expression that is rarely encountered below £400, and unequalled in this particular group of speakers. Unlike the two-driver systems, which tend to have a slightly cool overall character, the Mercury F4 sounds if anything a little too warm and rich through the upper bass and lower midband, while at the same time the broad presence band is just a little restrained. The stereo image focuses very well - provided you sit down, so that your ears are within a slightly restricted vertical window bounded by the drive units. The Tannoy's colorations are modest, with few signs of box coloration as such, but speech has a slightly pinched character. Criticisms are therefore minor, and the net result is a sound that is both comfortable and easy on the ears, yet is also very effective at communicating the vigour and dynamics of the musical performance - very impressive at the price.